Recently one of the best poker players in the world, Phil Ivey, won over $10 million playing Baccarat in a casino located in London. The value of a hand is determined by adding the values of its individual cards. Tens and face cards are counted as zero, while all other cards are counted according to face value. Ace is worth one. To calculate the points, add the card totals and drop the “10” value. For example: K + 6 + 9 = 15 (because the K = 0). By removing the ten, the hand is worth 5 points. So all baccarat hands have values in the range 0 to 9 inclusive and the hand with the most points (the closest to nine) wins.. The player and dealer are given two cards each. When the player or dealer has eight or nine points, the game finishes. Whether banker draws to the third card or not is decided by following a set of more complex rules. If the banker's first two cards total 6 or more, then the banker must stand without drawing a card. If the banker's first two cards total 0, 1, or 2, then the banker must draw one card. Though, if the player did draw a third card, the banker follows a more complicated set of rules that are outlined below. The dealer’s two-card total is 2 or less. The dealer’s two-card total is 3, and the third card of the player is not an 8. The dealer’s two-card total is 4, and the player’s third card is not a 0, a 1, an 8 or a 9. The dealer’s two-card total is a 5, and the player’s third card is a 4, a 5, a 6 or a 7. The dealer’s two-card total is 6, and the player’s third card is a 6 or a 7. 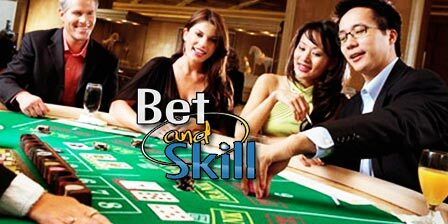 A bet on a Tie pays 8 to 1 (or 9 to 1, depending by the casino) without any commission fee. If there’s a tie but no bet was placed on a tie, bets on the "Banker or "Player" are returned. A bet placed on the Banker’s hand that wins results in an even money payout on the initial bet minus 5%, which goes to the house. A bet placed on the Player’s hand that wins results in an even money payout on the initial bet, with no percentage going to the house. The banker draws more cards so odds of the banker winning are slightly better (even if there is a 5% commission fee). When you bet on the Player's hand, the house edge is 1.23%. When you bet on the Dealer's hand, the casino has advantage of 1.05%. It is one of the lowest house advantages in the casino. The bet on the Tie is the worst one in baccarat because this bet gives to the house an advantage of around 5% (with 9 to 1 payout) to around 14% (with 8 to 1 payout). By using a single deck, house edge on 'dealer' bet is 1.29%, house edge on 'player' bet is 1.01% and 15.57% on the tie bet. There is no strategy or optimal way to play Baccarat simply because you do not make any decisions that have an impact of your actual hand value. Professional Baccarat players and mathematicians have determined that card counting is not effective in overcoming the house edge at the baccarat tables. Compared to blackjack, card counting is about 9 times less effective when used against baccarat. Anyway, there are a couple of gambling systems that can be applied on Baccarat, such as Labouchere, Paroli, D'Alembert and Martingale. BGO Casino: cliam your free spins, no deposit bonus or welcome package here! "Online Baccarat: rules, payouts, tips and top 10 casinos"